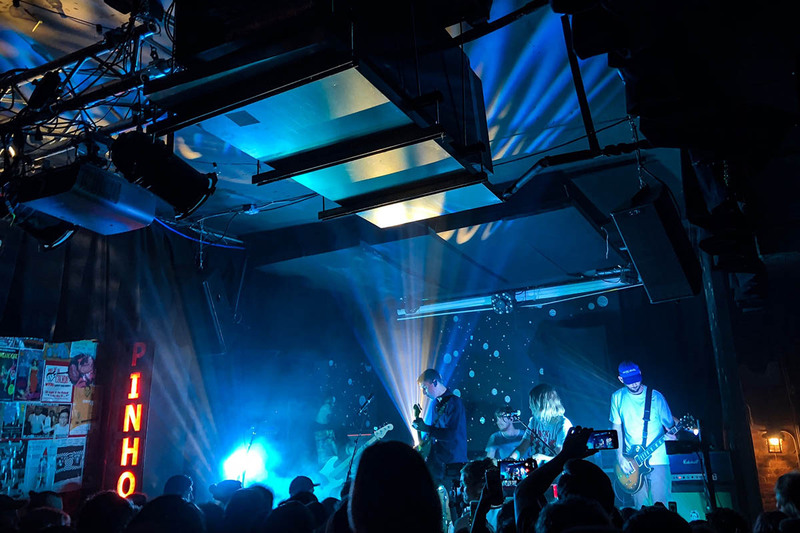 The post Exploring the Vibrant Local Music Scene appeared first on Duke Daytime MBA Student Blog. Music has always been a big part of my life. 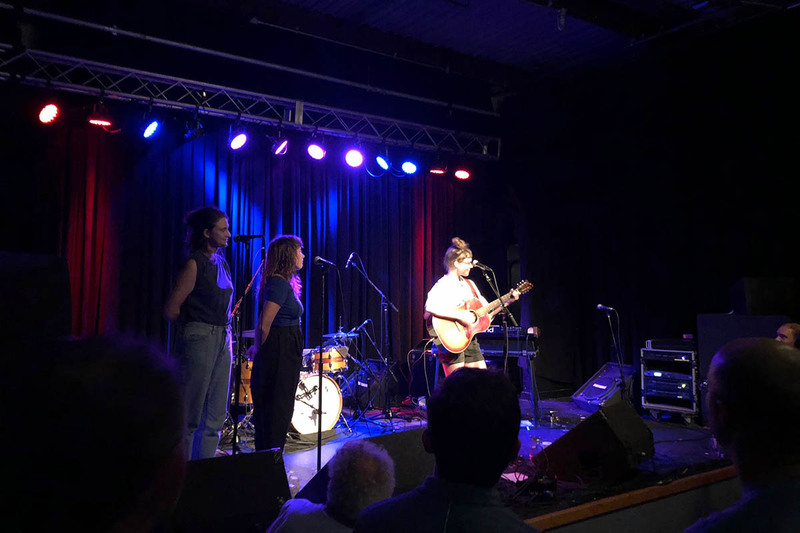 Moving recently from New York, I was pleasantly surprised by the diverse and vibrant music scene in Durham and the greater Triangle area. With many live concert and music venues hosting various artists throughout the year, you can always find a show of any genre on any given day. Many well-known musicians often include a stop in the area during their tours. And it is also exciting to discover some incredibly talented local musicians. Exploring the local music scene and its variety of venues has been my favorite off-campus experience so far. In addition to following tour announcements of my favorite artists and subscribing to the venues’ newsletters, I often pick up a copy of the Indy Week newspaper and browse through the music section to learn about when, where, and who will be jamming some music in the area. Here are a few of my favorite spots. 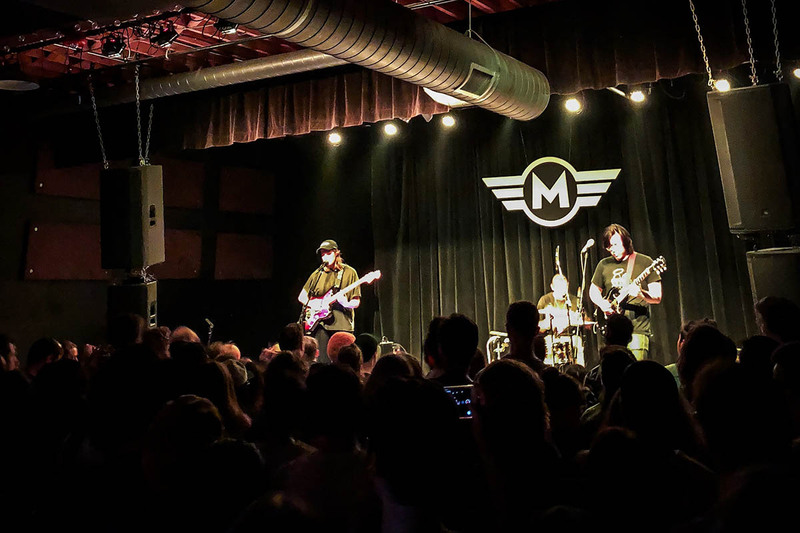 Conveniently located right across from The Pit, a popular barbeque spot, and Fullsteam, one of the best local breweries, Motorco is a fun place to spend an evening. The space was converted from a midcentury car dealership and is Durham’s biggest music club. I like Motorco’s overall industrial style. Even when it gets full with big headliners, I never find it overly crowded. In addition to the space for music, it has an adjacent full bar featuring craft beers and a kitchen offering small plates inspired by global street food. Pinhook is a much smaller and more intimate venue located in downtown Durham. It has a down-to-earth and laidback vibe, and the staff is very friendly. Like many places in the area, it provides a great community feeling. Because of its limited space, it can get packed and stuffy when there is a sold-out show, so be prepared to get sweaty if you happen to be at one of those. 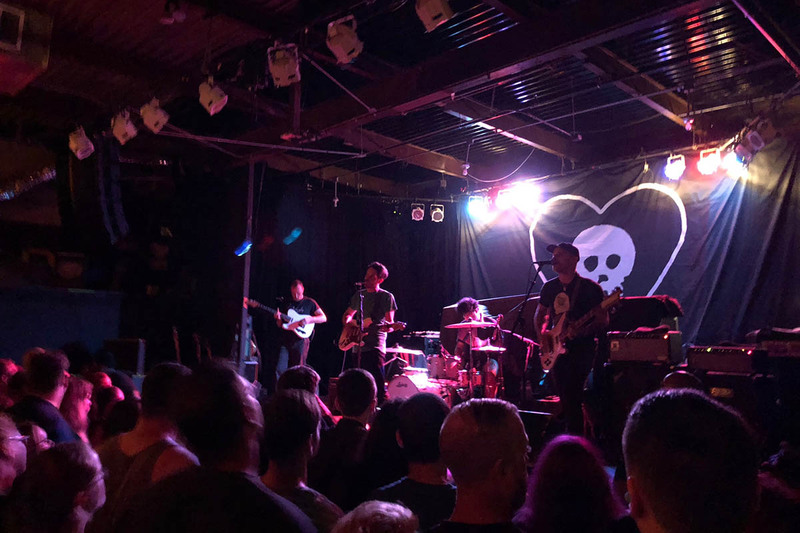 Just a 20-minute drive away from Durham, Cat’s Cradle—near Chapel Hill in Carrboro—might be one of the most famous live music establishments in the Triangle. It has been around for more than 40 years and has hosted a variety of great artists. As it has two separate spaces, on any given night, there might be a national headlining show going on in the main room, and a more intimate performance by local musicians in the back room. The back room is cash only, and while there is an ATM, bring some cash if you want to avoid the hassle. Thrity miles west of Durham, Hall River Ballroom is a music venue located in a small town called Saxapahaw. Going there is like a small adventure. 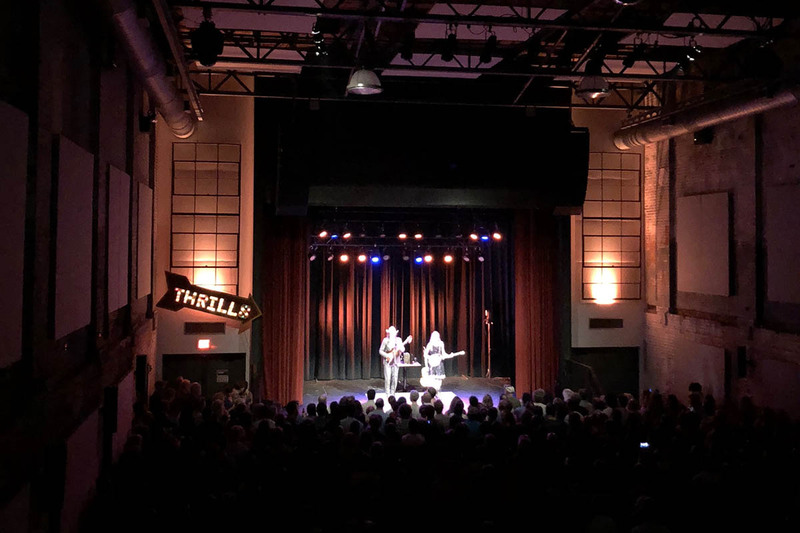 Getting off the highway and driving through the farmland, you will find a small strip of local business surrounding this live concert space that was converted from a historic cotton mill. It has three levels, and its outdoor decks allow people to enjoy a great view of the Haw River during the day and starry sky at night. Although parking could be a little tricky, it is still totally worth taking a trip there to enjoy some music at a unique and charming space. This is by no means an exhaustive list. The Durham Performing Arts Center is ranked as one of the top-ten theaters in the country. Head to the nearby city of Raleigh, and you can find some large stadiums and amphitheaters that attract the largest national acts as well as smaller venues like Kings and Lincoln Theatre. For those who enjoy music festival experiences, Raleigh also has large annual events like Hopscotch and the Wide Open Bluegrass festivals in September that attract audiophiles from across the country. With all these great options, I am excited about continuing to explore the eclectic music scene in the area. For all my fellow music lovers, we are exactly where we need to be. 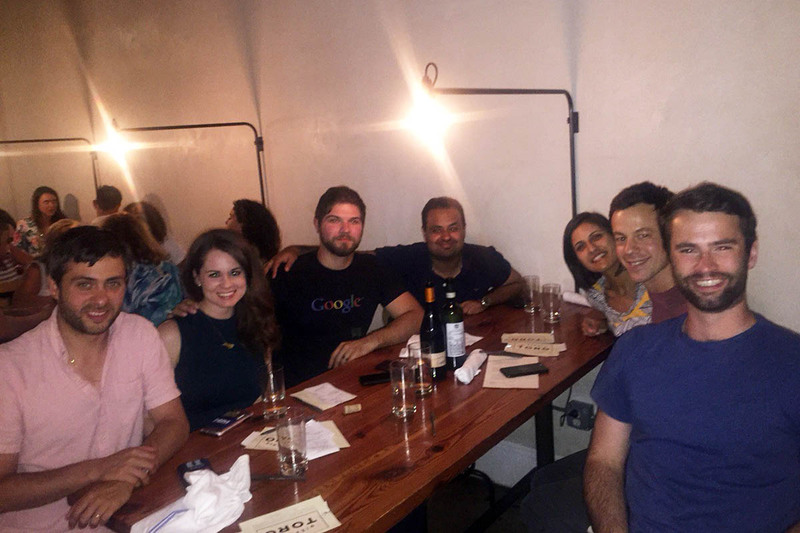 The post Conference Insights: Ten Years from the Bottom appeared first on Duke Daytime MBA Student Blog. If someone asked you to discuss the 2008 financial crisis, your first thoughts may be a recollection of newspaper headlines, textbook passages, or classroom lectures. To Wall Street CEOs however, their thoughts on the crisis transported them back 10 years ago to memories of their back-room negotiations with regulators and other banks. 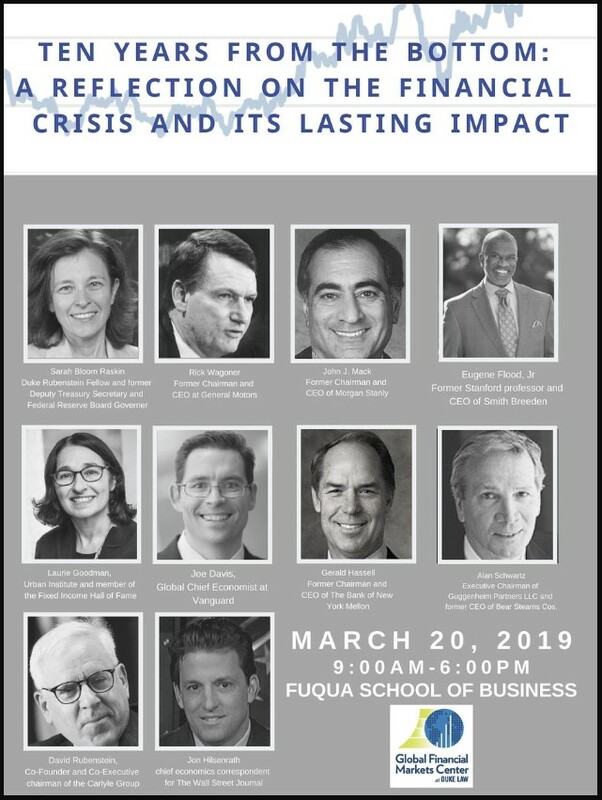 On March 20, 2019, at the “Ten Years from the Bottom” conference, former CEOs of Morgan Stanley, Bear Stearns, BNY Mellon, and GM—along with Duke alumni, faculty, and other financial experts—shared with students their personal memories of what happened behind the scenes, away from the public eye. The former CEO of Morgan Stanley, had a particularly harrowing story to share. At the time, many hedge funds took advantage of the situation. Those funds continued to buy credit default swaps (CDS)—insurance-like investments that would be profitable if Morgan Stanley defaulted on their debts. As the traders pushed up the price of these CDS, the fears of a Morgan Stanley default increased. Fearful Morgan Stanley customers began withdrawing capital in droves leading to a liquidity crunch. Traders continued to short Morgan Stanley which almost led to the collapse of the firm. Hank Paulson and Tim Geithner, the central bankers at the time, wanted to prevent another collapse. They pressured John Mack to sell the firm to J.P. Morgan for prices as low as $2 a share. It was wild to hear about John’s phone calls with Jamie Dimon at J.P. Morgan, as both CEOs sized each other up. John Mack recalled ignoring calls from the central bankers and instead focused on negotiating with potential Japanese investors for additional capital. The last thing he wanted was a fire sale to his competitor J.P Morgan. The interview between David Rubenstein, co-founder of The Carlyle Group, and Alan Schwartz, the former CEO of Bear Stearns was another opportunity to hear personal stories from the crisis. Alan Schwartz was attending a conference in Palm Beach as rumors of Bear Stearns’ liquidity problems swirled. This prompted Alan to make an impromptu appearance on TV to calm the public. By the time he got back to New York though, Alan knew the damage had been done. The rumors got out of hand and a classic bank run on Bear Stearns occurred. Bear Stearns normally financed operations by lending high-quality long-term assets as collateral for cash through a repurchase agreement. Due to the rumors, investors no longer trusted the collateral, leaving the firm with a bunch of high-quality long-term assets, but no cash to fund their operations. Their $18 billion cash balance evaporated, and their stock plummeted 47 percent. Everyone realized that Bear Stearns would not survive the weekend. The U.S. Treasury saw that the only way to save the firm was to sell to J.P. Morgan. Alan explained that the negotiations with Jamie Dimon were fierce with negotiations starting at $2 a share which rose to a final agreement of $10 a share. The common theme in both stories is that trust may be the most important factor in modern financial markets. The moment society loses trust in the financial system, billions of dollars will be withdrawn, and firms will have no choice but to sell valuable assets for pennies on the dollar to survive. Perception is everything. Wall Street knew this, which is why many banks tried to refuse Troubled Asset Relief Program funding to appear strong. Thankfully, Financial markets are much stronger today than they were 10 years ago due to regulations and oversight. I hope Wall Street continues to evolve and conduct business transparently so that we no longer question the integrity and stability of U.S. Financial markets. 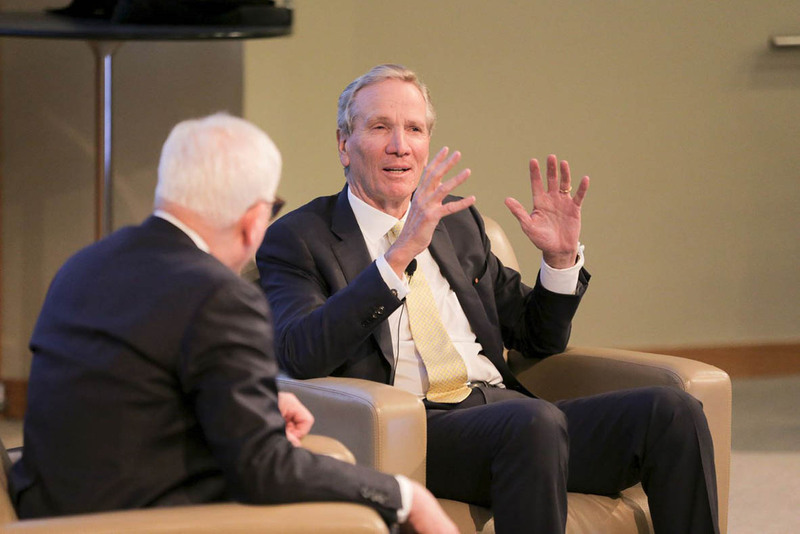 The conference was full of stories and personal perspectives from former CEOs, former central bankers, economists, congressmen, journalists, policy experts, and professors. Naturally, there were some disagreements in opinions. Were the bankers criminals who deserved jail time? Former Congressman Brad Miller sure seemed to think so. Professor Lawrence Baxter disagreed however, arguing that you can’t necessarily blame anyone when the meltdown was completely decentralized with multiple layers. Were Ben Bernanke and Hank Paulson heroes for the bailouts? “Absolutely” touts John Mack and Alan Schwartz. To some members of the crowd however, the funds should have gone to more deserving parties. One thing we all agree on is that this event was the perfect example of the diversity of thought at Fuqua, and we thank the Global Financial Markets Center at Duke Law and Fuqua’s Finance Club who were among the sponsors that made it possible. Attending school here has opened my mind to so many unique perspectives and viewpoints that I would not have heard anywhere else. The deep finance alumni base at Duke will allow for many more future events where we can hear from industry leaders and continue to develop our take on the world. The post 10 Things to Do After You’re Admitted appeared first on Duke Daytime MBA Student Blog. Now that you have received the highly anticipated call, you must be asking yourself what you should do next. Here are 10 steps to help you navigate the upcoming months after you’re admitted to the Daytime MBA program. Applying for an MBA is a long journey, and being successful in the end is definitely the best part. So, of course, you deserve to celebrate this special moment with your loved ones! It would not have been possible to get into business school by yourself, so also take the opportunity to thank everyone who supported you during this time. Attending Blue Devil Weekend (BDW) is a must-have experience, and was my favorite one as an admitted student. If you are not convinced why should you come, read these BDW blogs that explain more about the event and its value. Start planning when are you coming—February or April or both! If your boss was one of your recommenders, he or she is waiting for this big news. If not, you must find out what is the best way to reveal it. Give as much time as possible so your company can hire and train your replacement. Your boss will appreciate it. You have to provide some documents to Fuqua, including previous school transcripts and immunization records. These details and other vital information are listed on the Incoming Student Website that you can access once admitted, so refer to that site often. Also, if you need a student loan, it is a good idea to start the process as soon as possible. Finally, if you are an international student, you have to apply for a visa. It might seem like a lot, but it is not. Fuqua will send you a letter explaining next steps, so just keep track of everything you have to do and don’t put it off. Here’s an extra tip for international students: it is important to set everything up in your home country before you move. Remember to put your bills on autopay, or ask someone to help you with them while you are abroad. Consider also delegating power of attorney in case you need any help back in your country. There are great options for living around Durham, so it is time to start thinking about what your priorities are. Are you coming with your family or by yourself? Do you prefer living closer to Fuqua or downtown? Are you buying a car? Have that in mind while you check here some of the top options for Daytime MBA students. Start considering whether you prefer to buy new furniture or a package of several used pieces from a graduating student. If you want to save some money or if you will not have enough time to shop once you move, I recommend you join our Fuqua Facebook group for buying, selling, and leasing. Keep an eye on the options available—the best ones are sold very quickly. It is time to think about what you will bring with you to Durham. If you are flying, you will probably face some constraints, so be smart as you pack. Keep in mind that you can buy bedroom and bath linens for a great price here, so do not waste space on those items. Take this opportunity to sell or donate clothes you will not wear for the next two years. The more you can do before classes start, the more you will be able to focus on other opportunities when you arrive. I strongly recommend you to finish the below assignments before you move. MBA Math is an online quantitative course that will help you review some math you probably have not seen since high school, and will also teach you some basic concepts we will explore later in the curriculum. There are some mandatory modules, but doing all of them will give you a stronger base for the start of Fall Term 1.
Business Computer Applications is an online Excel course. You are supposed to complete it by the end of Fall 1, but finishing it before orientation starts in August will give you a lot more free time to get to know your classmates and Durham. Career Management Center assignments range from readings to working on your resume, and there are some that you must complete before August. But again, anticipate a whirlwind of activity once orientation begins and do yourself a favor by completing them earlier. If you have a strong academic or professional background in some of the core course subjects (including marketing, finance, accounting, among others) you can ask for an exemption. Having this extra free time will allow you to join more advanced classes ahead of time, and that might give you an advantage when it comes to recruiting for certain industries. I strongly recommend you to move at least two weeks before orientation (or International Student Bootcamp if you’re required to attend) so you can settle down before your first day at Fuqua. Make sure you have enough time to unpack everything and get used to your surroundings. International students, as soon as you get here, buy a local SIM card for your phone and open a bank account if you will need one. Don’t forget to register at Duke Visa Services and go to the Department of Motor Vehicles (DMV) to get a local identification card. Most places do not accept IDs from other countries, and you probably do not want to have your passport with you all the time. Also, if you are planning to buy a car, you will need a driver license issued in the U.S. If you do not have one, you will have to take a driver test at a DMV office. Durham is such an amazing city, so explore it as much as possible when you first arrive. Our blog has great posts about what to do once you are here including exploring the local beer and dining scenes. 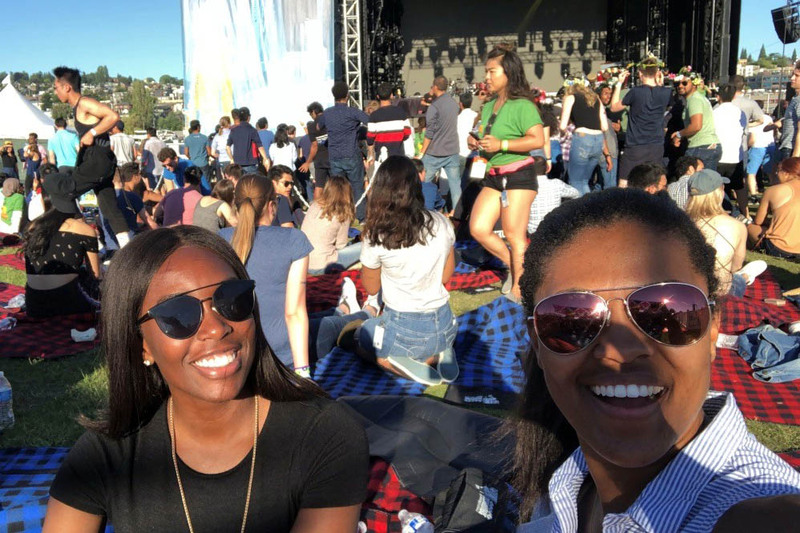 The post Fuqua Around the World 2019 appeared first on Duke Daytime MBA Student Blog. This year’s Fuqua Around the World, the sixth for our global networking event, proved to be bigger and better than ever. What started as a partnership between our Development and Alumni Relations team and the Office of Admissions has now become an annual tradition where Fuqua alumni, current, and admitted students come together on one evening to reminisce and network. We saw a 20 percent increase in registrants this year, which pushed us over 3,000 for the first time. And by adding new locations—Düsseldorf; Geneva/Lausanne; Istanbul; Seoul; Baltimore, MD; Grand Rapids, MI; Jacksonville, FL; Palm Beach, FL; Santa Fe/Albuquerque, NM; Wilmington, NC—we brought the total up to 92 cities around the globe that hosted an event. None of this would be possible without the help of 130 alumni volunteer ‘hosts’ who we’re always thankful for. And to all those Fuqua bound admits in attendance, we look forward to seeing you in Durham soon! #FuquaATW is well underway with lots of smiling faces. Check out our bio link for more info, and in the meantime, here’s the Tokyo group! Thanks to everyone who attended #FuquaATW in Minneapolis! And that’s just some of the action. For more photos check out #FuquaATW on Instagram and Twitter. We hope to see you next year! 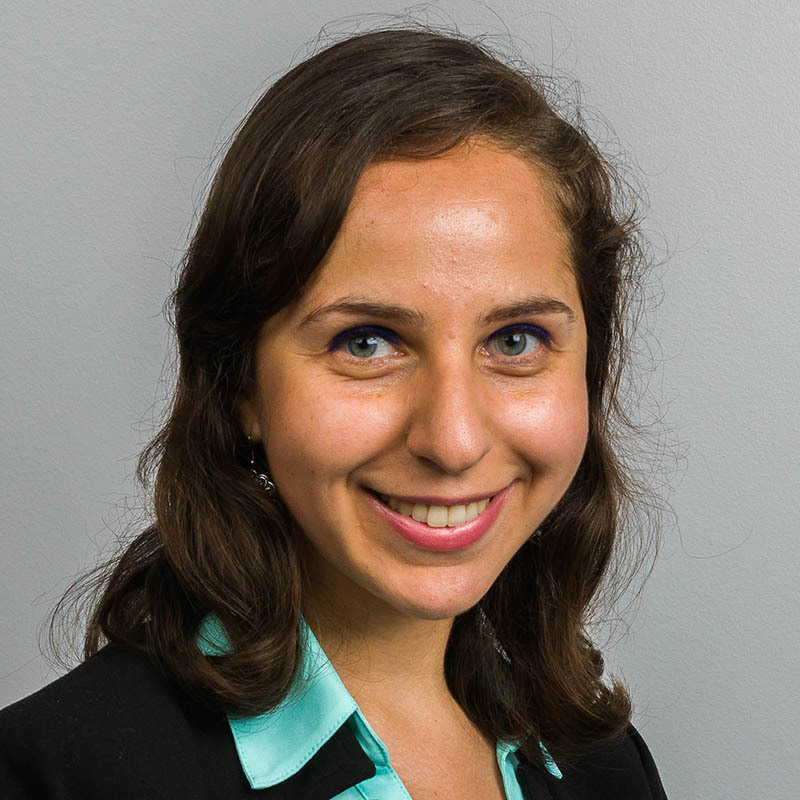 The post 4 Lessons from My Microsoft Internship appeared first on Duke Daytime MBA Student Blog. As a PMM, be prepared to play several different roles. I had the opportunity to work cross-functionally and influence key stakeholders on my new ideas. There were several times I had to switch roles, adapt to unexpected challenges, and appreciate the needs and values of my stakeholder to accomplish the end goal. So be ready to design, consult, sell, execute, and lead. Showing the organization you can jump into any role to get the job done, is a perfect way to succeed in your internship. 2. Ideation is cool. Implementation is even better. Managers love interns because we bring fresh ideas and insights. On the other hand, what makes you stand out more during the internship is how well you can execute a strategy. As a PMM, I created and executed a marketing strategy to drive adoption of a Microsoft product across various industries. I was pushed out of my comfort zone and realized that I am creative and a great executor. Take your internship to the next level by executing your strategy and executing it well. 3. Don’t underestimate the power of networking. Have you ever heard the saying “your network is your net worth?” Well, it’s actually a very powerful phrase that can take you far in your next career. 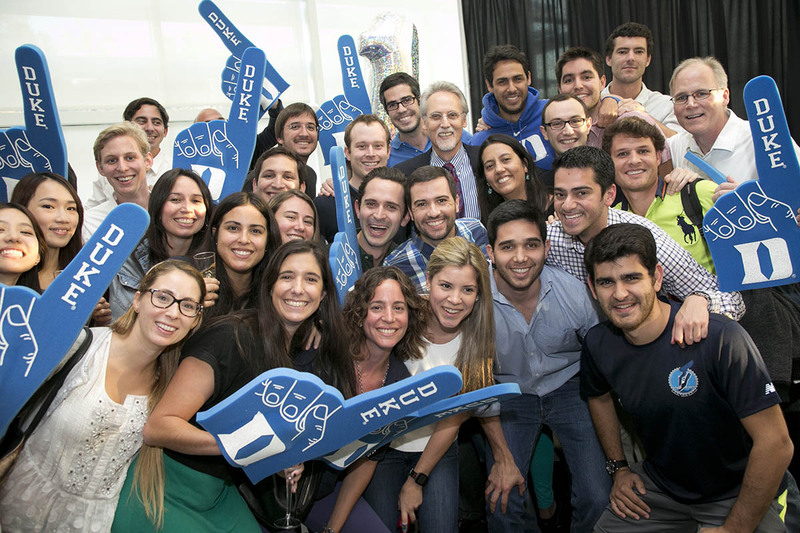 Microsoft has over 120,000 employees who believe in collaboration and building on the works of others. During my internship, I learned the importance of leveraging the right contacts. I conducted several informational meetings with counterparts inside and outside my team to learn more about other organizations and Microsoft’s culture. It was during those moments I learned the implications of my project for my team as well as others. Believe it or not, a 12-week internship goes by pretty fast. While you may want to focus on preparing for meetings, networking with full-time employees, and delivering your final brief, don’t forget the summer is yours. This is the time to meet interns from other business programs, explore the city, and take on new experiences. 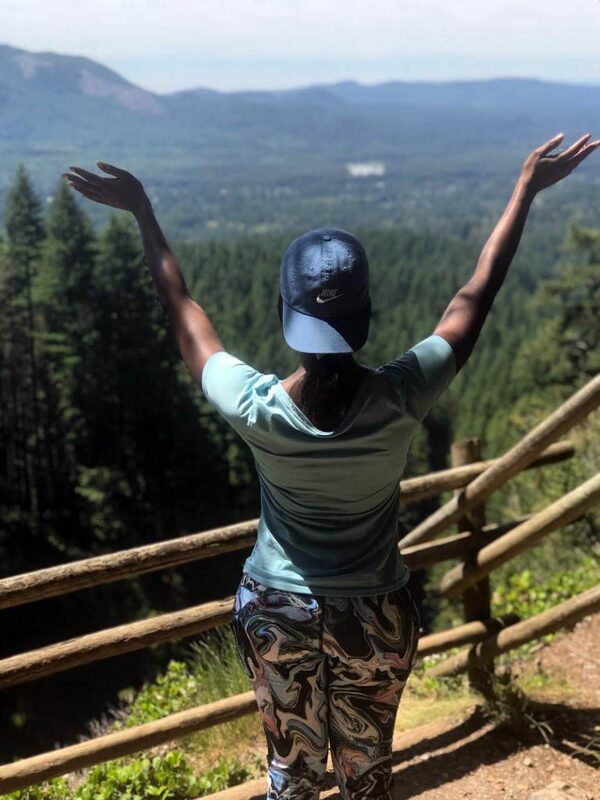 While in Seattle, I hiked five different trails, dined at more than 20 new restaurants, and gained a tremendous amount of new memories and friends. 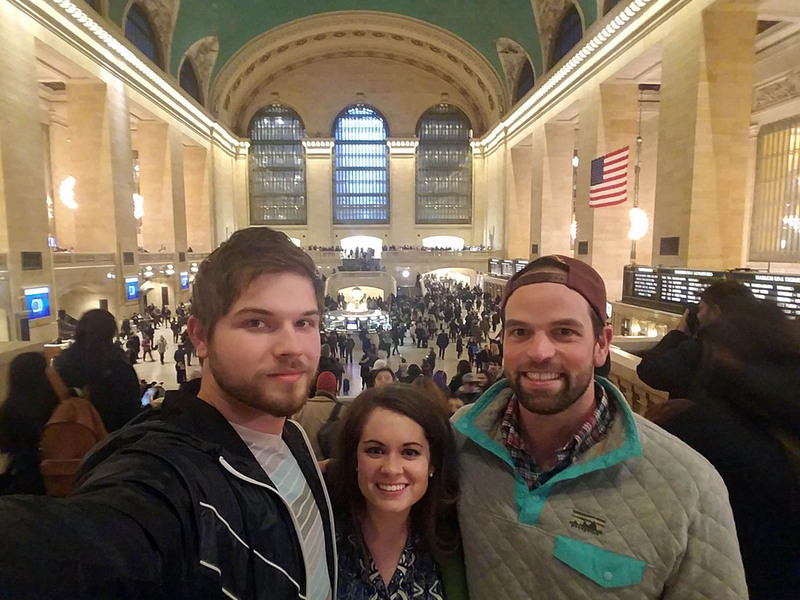 The post My Favorite Fuqua Memories appeared first on Duke Daytime MBA Student Blog. I left Fuqua last May ready to rejoin the working world, armed with a new degree and a great deal more knowledge about business, marketing, and health care. The education exceeded every expectation I had of business school. However, as I think back to what the last two years have meant, my experience transcended more than just the academic coursework. As it turns out, my favorite Fuqua memories are about the people, culture, and drive that make this place special. I’ve written before about my passion for health care and decision to pursue the Health Sector Management (HSM) Certificate, but fall break of my first year truly solidified that passion. 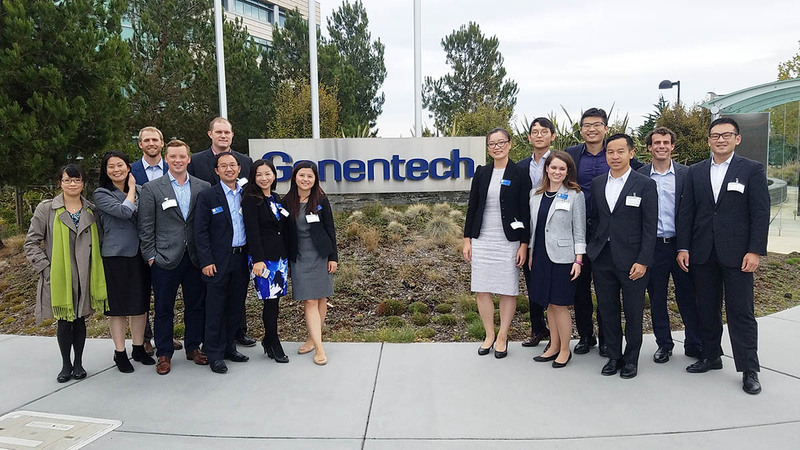 I joined a group of 12 other fresh-faced HSM students to travel to San Francisco and visit companies like Verily, Intuitive Surgical, and Genentech. Seeing the application of classroom principles was exciting, but so was taking my new friends wine tasting in Napa Valley and posing for touristy photos by the Golden Gate Bridge. It’s no secret that I love craft beer—I was even cold-called multiple times in Professor Aaron Chatterjee’s strategy classrooms when we studied the Boston Beer Company. 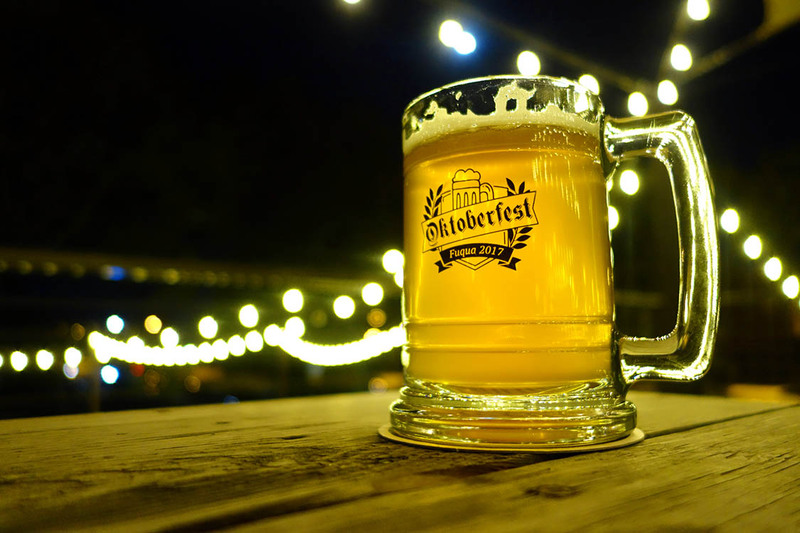 As co-president of the Fuqua Beer Club, I got to attend and plan beer-themed events with my classmates, and our Oktoberfest event was my favorite. Selling out of 250 tickets, we toasted German culture with the European Business Club and savored bratwurst while catching up with friends. I had no idea what a case competition was when I started school. Once I was initiated, I quickly realized that getting to collaborate with a team of students on real-world business problems and then present our ideas to senior leadership of companies is an experience that makes business school unlike most other graduate school programs. Two of my favorite competitions were with Cisco Systems, where I eventually interned, and (no surprise) AB-InBev on a case that involved craft beer. My teammate, Reece, and I even got to fly to New York to present to the AB-InBev team. Getting to mentor two teams, each made up of six first-year students, as a Coach K Center on Leadership and Ethics (COLE) fellow was one of the highlights of my second year. Each student brought a different set of experiences and beliefs to their team, and it was inspiring to see the two teams work through the issues and demands of their first year. They taught me more about teamwork and success than any other Fuqua experience and challenged me to be a better leader. I’m so proud of what they accomplished individually and I’m excited to keep in touch with all 12 as they progress in their careers! Objectively speaking, I had the best Consequential Leadership (C-LEAD) team in the Class of 2018. While there is no way to verify that statement, I really did luck out with the five students I was paired with. They gave me the encouragement to break out of my shell, the support when recruiting got tough, and really became like a second family. Every term we would get together for dinner and spend hours laughing and talking. At our last dinner, we couldn’t bring ourselves to say goodbye, and instead made the promise to “get lunch before everyone left,” knowing full well that was impossible. I was lucky enough to go on “Treks” both years at Fuqua. My first year, I joined 80-plus students in Japan, and my second year our group of 95 toured around Israel and Petra, Jordan. These trips were loud, exhausting, and jam-packed with cultural and historical information, but being led through a new country by my Japanese and Israeli classmates made the experience truly unlike any other. Fuqua is lucky to have such a rich, diverse group of international students and these trips reflected that. 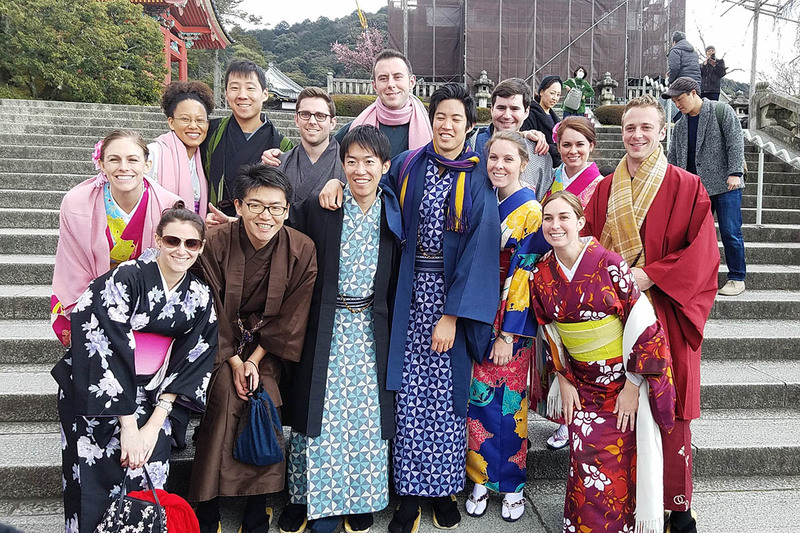 Our inclusive culture was also highlighted by these trips—my husband, Pavel was able to come on both and we made some of our best Fuqua friends in Japan. 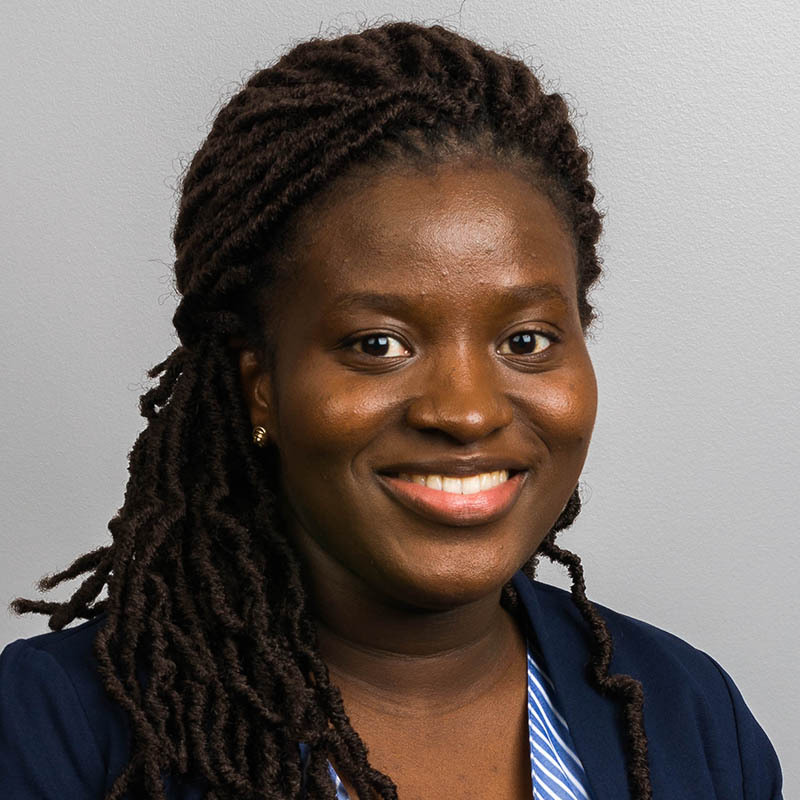 The post Women in Leadership: Takeaways from Professor Ashleigh Rosette’s Course appeared first on Duke Daytime MBA Student Blog. The mark of a hearty, stick to your ribs MBA course is one in which I’m able to make a little more sense of the business world. The recipe behind these great courses consists of a professor who is adept at drawing forth discussion from an engaged community and helping them make those ‘a-ha!’ connections with ideas and experiences they were already familiar with but hadn’t understood in the context of their experiences before. Professor Ashleigh Rosette’s Women in Leadership course was exactly this. Prior to taking the class, I was aware that women were under-represented in leadership positions and that systemic biases against women exist. During the course, I used Ashleigh’s framing of the issues and my classmates’ anecdotes to finally make sense of some of my previously unexplained experiences as an Asian-American professional woman. I consider myself a friendly and open individual. However, I’ve consistently gotten feedback in professional settings that I can be intimidating. I’ve also had a teammate remark on the fact that I am a great leader, but I should pay attention to my physical appearance more. Before Ashleigh’s class, I thought it was a ‘me’ problem. I must not be as friendly as I think and my personal appearance really must be sloppy. After Ashleigh’s class, I saw clearly that the societal norms we had discussed were quietly and effectively operating on me and my coworkers. I was exposed to research that found Asian-American women are seen as competent but less warm, and women, in general, have a higher standard when it comes to personal appearance. Something clicked for me—I was not wholly to blame for perceptions others had of me. By thinking it was my problem alone, I had fallen into the trap of it myself. Because of the class, I’ve committed myself to doing better and seeing more. The class has shown me that there is a community of willing and engaged peers that can help me see these situations more clearly. I’ve also learned not only how to help myself, but how to help my colleagues and future reports. For example, I can use and design evaluations and peer review guidelines to screen out biases for gender, age, and race. That would force the reviewer to give feedback controlled for sensitive identities. 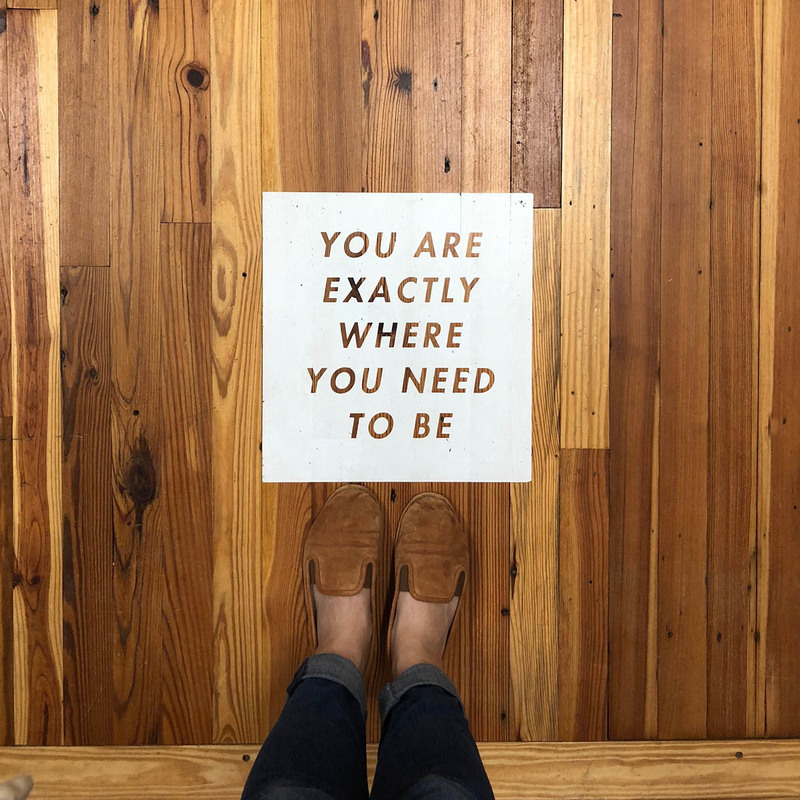 I’m grateful for Ashleigh’s class because it gave me the tools, language, and community to make more sense of myself in the professional world, and to empower those around me to see and make sense of their own situations as well. For more details from our Women in Leadership class discussions, check out the videos below. 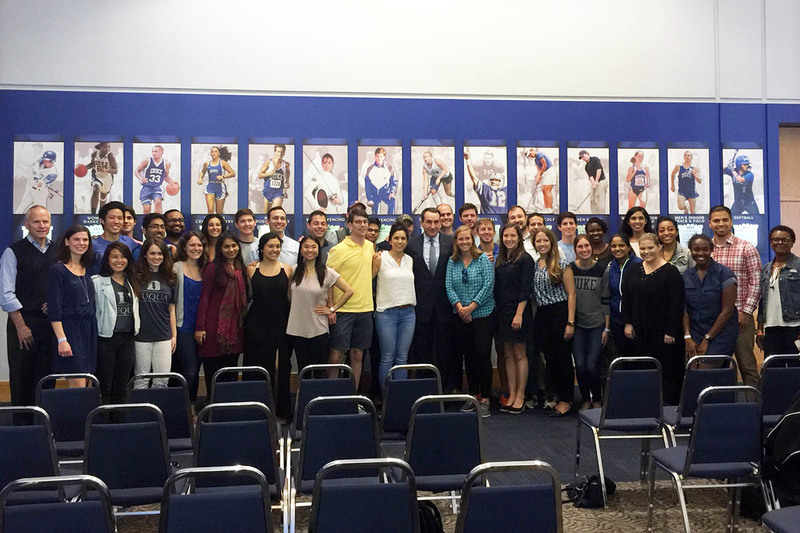 The post How Duke Basketball Helps Shape the Student Experience appeared first on Duke Daytime MBA Student Blog. There is a motto at Duke University and the Fuqua School of Business—work hard, play hard. Sure, our students spend a lot of time working on case studies, but they also spend a lot of time outside of the classroom at Cameron Indoor Stadium, the home of Duke Basketball. 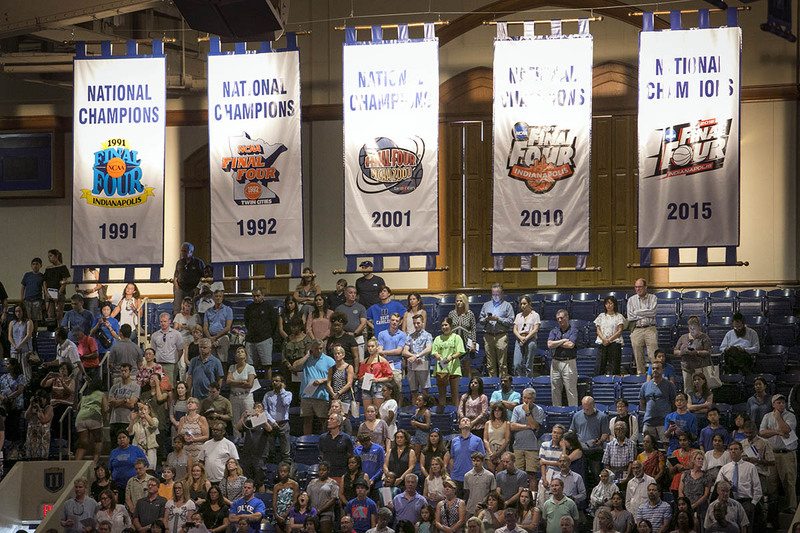 The Duke Blue Devils Men’s Basketball Team has won five NCAA National Championships and made 11 championship game appearances. Coach Mike Krzyzewski has served as the head coach since 1980, and this year became the all-time winningest coach in college basketball history—currently having 1,124 wins. 2015 is when the men’s team won its fifth national title. 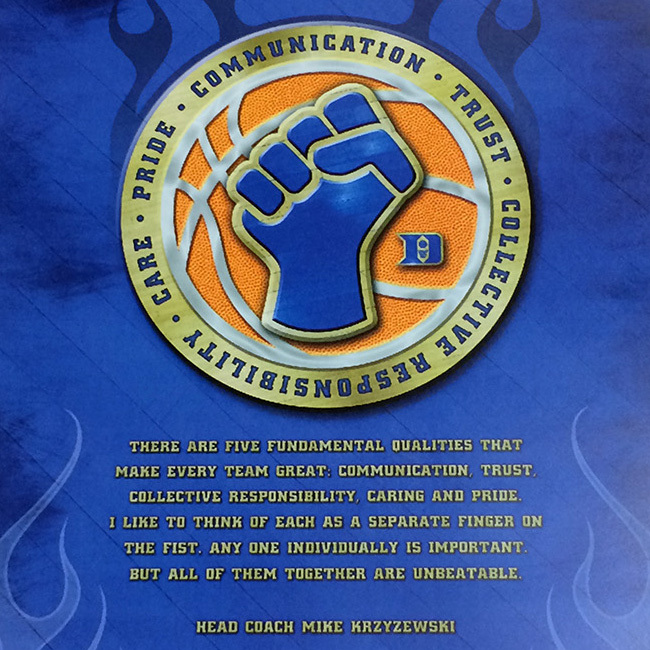 Coincidentally, that same academic year Bloomberg Businessweek ranked Fuqua as the number one business school in the U.S.
Coach K is known for his “fist” analogy when it comes to talking about teamwork. There are five teammates who play on a basketball court, just like you have five fingers on each hand. Rather than going at something with one finger, when those five players, or fingers, come together to form one fist, it combines all of their talents to become stronger as a group. That same team mentality is true at Fuqua, where we believe in moving teams forward toward a common goal. Duke basketball fans, also known as the Cameron Crazies, will travel near and far to watch the Blue Devils. Fuqua is known for bringing students and alumni together, and Duke Basketball is no different. 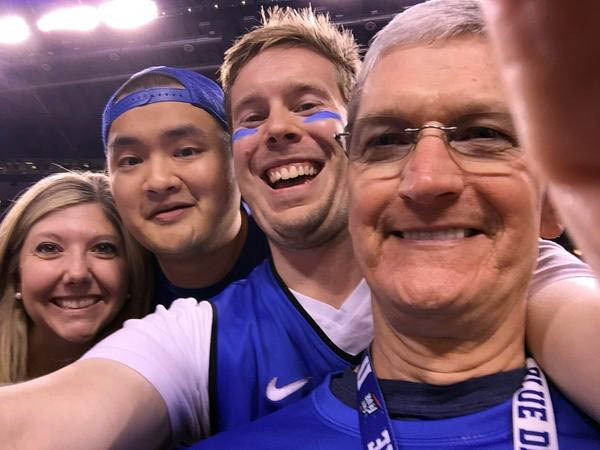 How often is it that you get to watch a Final Four basketball game with Apple CEO Tim Cook (MBA ’88)? Fuqua students don’t just attend games and support teams, they learn about the sports industry. At Fuqua, it is not uncommon for Fuqua Client Consulting Practicum clients to include professional and college sports teams. We even have our Media, Entertainment, and Sports Club, which among other activities, has partnered with Duke Men’s Basketball for the Duke MBB Stats team. All you need to have is a love for Duke Basketball—no data analytics experience required. 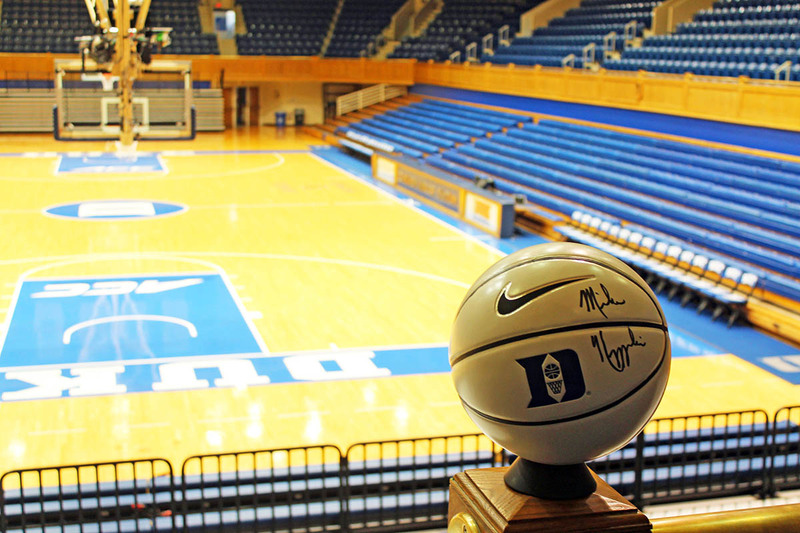 You have heard of cryptocurrencies, but at Fuqua, there is something way more valuable—signed Coach K basketballs. If you are lucky enough to score one of these at an auction or raffle, consider yourself lucky! Why pay $2,000 or more for a ticket to the Duke versus UNC game in Cameron when you can earn free season tickets! 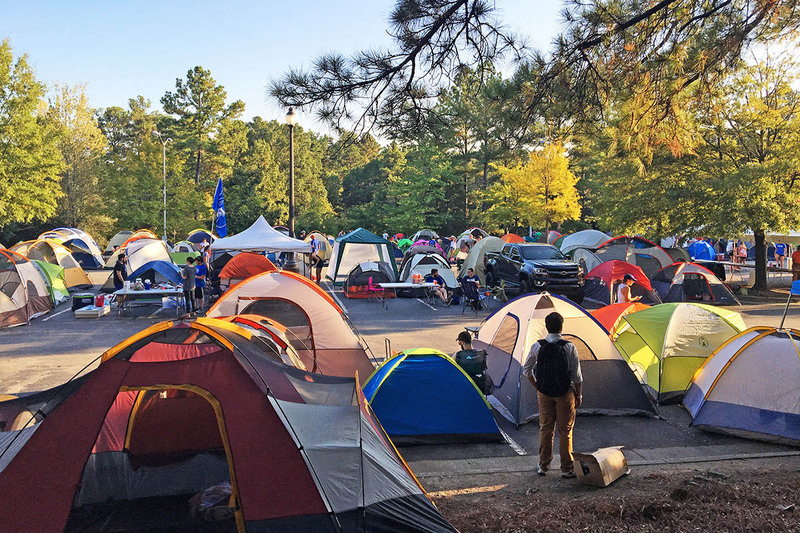 Each year, Fuqua students participate in the annual Campout tradition, where they camp out for 36 hours to enter the lottery to win season tickets. The Coach K Center on Leadership and Ethics (COLE) is an academic center at Fuqua, focused on talent and knowledge development in the ethical leadership context. Coach K might be busy with basketball, but he is a COLE executive-in-residence and will hold lectures for MBA students and host invitation-only summits on management challenges. The Duke-UNC rivalry is one of the best in college sports. Since 1920, Duke and UNC have met twice each year to prove which school has the better basketball team. While UNC has won six NCAA Championships, Duke fans feel pretty strongly that we might get our sixth title this year (fingers crossed and knock on wood)! And if all these examples prove how much we love basketball, take a look below at what the atmosphere is like on campus when there is a game. Let’s go Duke! 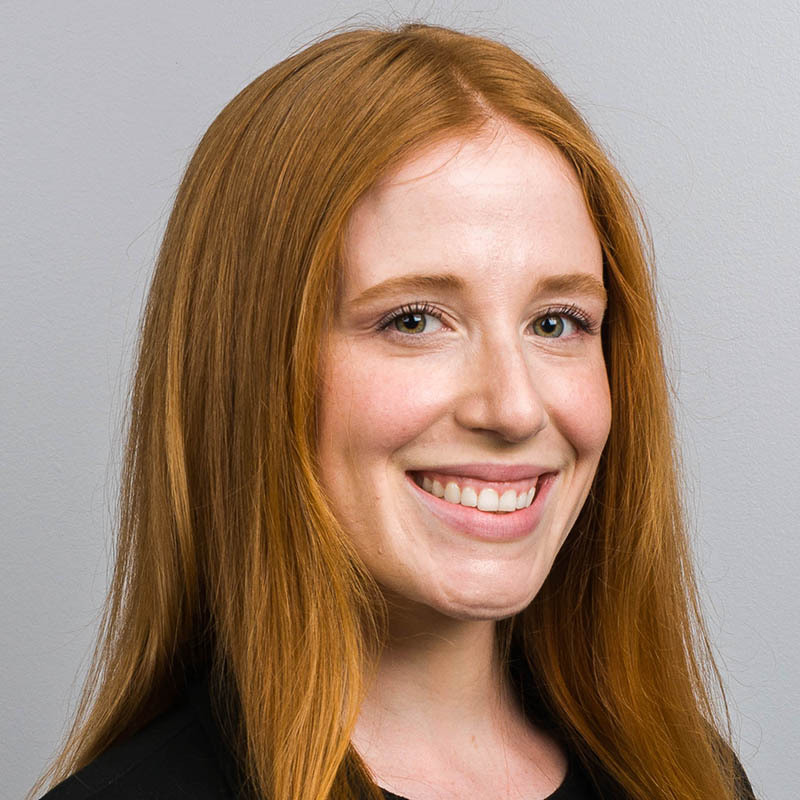 The post 5 Students Honor International Women’s Day with Reflections on Fuqua appeared first on Duke Daytime MBA Student Blog. International Women’s Day first began as recognition of a women’s labor strike in New York City 110 years ago, but has now grown to an international event that brings awareness and support for women’s rights and equal participation in business and politics. At Fuqua, the Association of Women in Business (AWIB) believes in taking this day to celebrate the many achievements of our female students and alumnae. Fuqua’s AWIB works to advance the goals of International Women’s Day year-round. The Daytime MBA Class of 2020 has the highest percentage of women ever enrolled at 42 percent. And while we celebrate progress, we recognize there is more to be done to reach parity. A record 248 women were appointed board directors at U.S. companies last year, but they make up just 31 percent of total new board directors selected in 2018.
International Women’s Day reminds us of how important AWIB’s mission is to promote Fuqua women’s success in business school and beyond as business leaders. This past year, AWIB has spearheaded new programming, including summer socials and health and wellness events to its annual Women’s Leadership Conference and international recruiting efforts to engage with all Fuqua women at every stage of their education and career. To stay on top of AWIB’s activities, follow us on Instagram and LinkedIn. Class of 2020 from Shenyang, China; Yorba Linda, California; Washington, D.C. The post 25 Random Things About My Section appeared first on Duke Daytime MBA Student Blog. The “25 Random Things” admissions essay is one of the not so random ways that Fuqua creates a diverse class of MBA candidates that push each other to grow both personally and academically. Speaking from experience, what seemed like an innocuous part of the application has become the backbone for how our community thrives off each other. 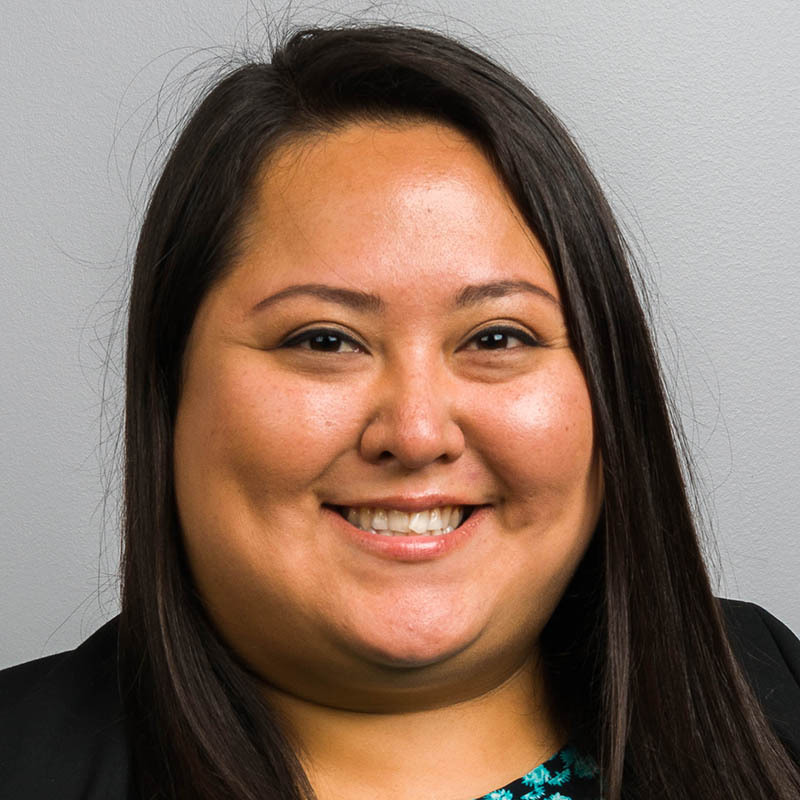 The random things aren’t just about finding what is special about an applicant, but understanding how those experiences can intertwine with others to create the unique Fuqua family. What does that look like? Well, you live your life at Fuqua as your true self and it happens naturally. Nobody from the class reads your facts, but they come alive through conversations, late night study sessions, happy hours, and countless case studies. After not swimming for almost 10 years, an Uno casually decided to pick up the sport again this summer—and qualified for the 2019 WORLD CHAMPIONSHIPS in Korea. Two New Orleans-based section mates lost their homes to Hurricane Katrina. Can you imagine having to take a boat to the only home you’ve ever known to try and recover whatever was left? Five people from Section 1 are lovingly called “Memmbas.” No, this isn’t a cool way to say members, but a dual degree program where you receive a Master of Environmental Management and an MBA (MEM/MBA). A month into school, I found out a section mate has a commercial pilot license. As in she can fly 737s. If business school doesn’t work out, she can operate Southwest Airline’s entire fleet. In high school, an Uno set the record by holding a 50-pound bag over his head for more than 13 minutes! Hope you wear deodorant, because a person in my section has a sense of smell that is three times stronger than the average human. “Yes we can” was a famous slogan used by Barack Obama during his presidency. “Yes he did” is the phrase we use for the section mate that worked in his administration. Duke won the 2010 NCAA Men’s Basketball National Championship. A section mate was on the opposing team in the championship game, having played four years of Division 1 basketball at Butler. Some people come to Fuqua to learn business concepts such as financial accounting. A person from Section 1 spent nine years as an accounting professor in Chile. Sunscreen is important! An Uno wears it every day of her life. A person in my section hasn’t eaten ice cream in over nine years. In fact, he hasn’t had one dessert in that timeframe “unless we count strawberries.” His daily meal of brown rice, spinach, and grilled chicken is legendary in the section. Almost 30 percent of my section speaks English as a second language. Is that an explosion or just a former nuclear engineer getting their MBA from Duke in Section 1? A California wildfire burned down someone’s house 30 minutes after she evacuated. Her perspective on what ‘home’ means to her now is something our section will never forget. Four people in Section 1 have babies under the age of one. Four people in Section 1 also drink more coffee than any human probably should. A section mate lost his leg serving our country. I play volleyball with him, and he taught me how to rock climb. Somebody in my section was homeless during her senior year of high school and is now getting her second degree from Duke University. She is unstoppable. At the ripe old age of 27, a section mate is already listed as a “famous alumnus” by her college. I’ve been doing Chinese food wrong my entire life. I found this out when a Chinese food chef and Section 1 member made me a home cooked meal from his country. A person in Section 1 can recite word-for-word the first season of Chapelle’s Show. Many people attend Blue Devil Weekend after being admitted, but most people don’t do it on their honeymoon. 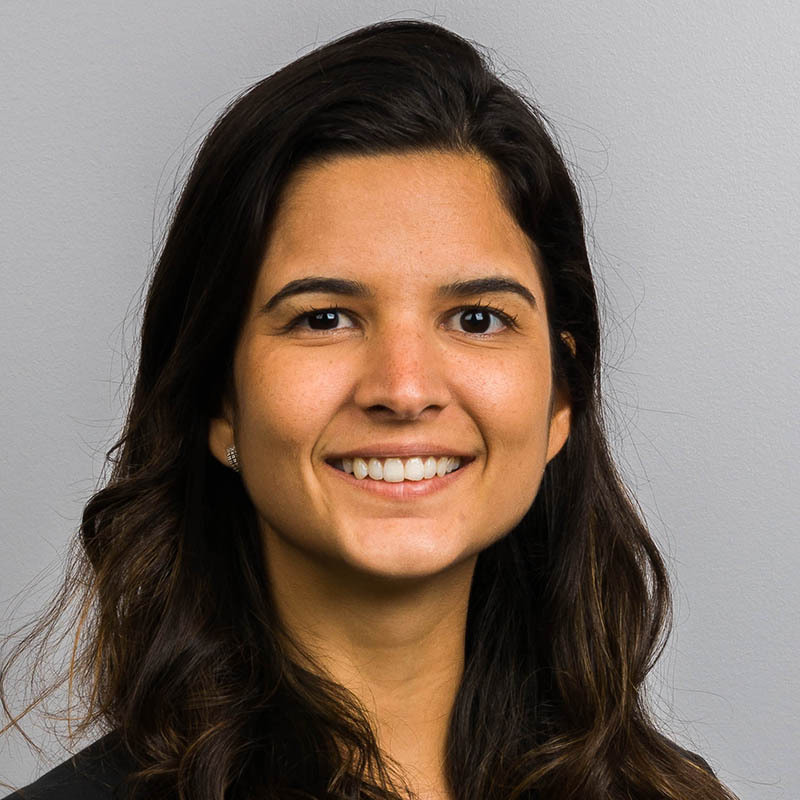 Yes, a section mate married her husband on a Thursday in Brazil, and then flew to Durham for their first days of “happily ever after” at Fuqua. A section mate serves as one of the founders of the Blue Ribbon Coalition’s first East Coast-based veterans program, designed to use outdoor recreation and nature to reduce post-traumatic stress disorder for veterans. “Double Dukie” is a term we use for people who also went to Duke for their undergraduate degree. One such Double Dukie has never missed a home football game in the combined 5-plus years he has been at the school. If you need to walk down a dark alley, I suggest bringing the two Jiu-Jitsu senseis from Section 1. There are over 370,000 entrepreneurs in India that have been trained as a direct result of the startup that was founded and operated by a Section 1 member.